I have the honor of dancing with a fabulous group of musicians, the Celtic - World Music - Sacred harp singing UZIZI. With its eight-member band of talented musicians, six-member chorus of talented singers and fellow dancer, clogger Jo ... we perform at special events and private parties. This photograph was taken during a performance during the 2013 Ingenuity Fest in downtown Cleveland on the main stage. One of my greatest joys is performing for senior citizens. They are the most receptive and appreciative of audiences. Dancing for them brings joy and entertainment. At a regular venue, one of the residents is in a wheelchair and when she heard that I was performing brought along her hip scarf and finger cymbals. 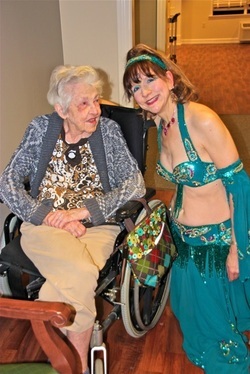 It turns out that she was a professional Middle Eastern belly dancer in the 1960's. I vowed that if I should be blessed with a long life, that I would be the woman in the nursing home with the jingling hip scarf and zills! This photograph was taken by the nephew of the wonderful 99-year-old woman pictured. 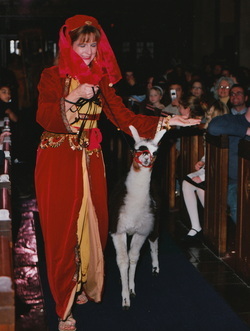 I have also lectured and performed for the church's major social group. This is one of my favorite photographs, taken by my husband. I think that it captures the joyful essence of Middle Eastern belly dance.